The AMC13 register set (and associated uHAL address table) is complex. This page attempts (will attempt!) to document it. The address table files are used for access to the board in software, and also used to automatically control the display and format of status information in the text "status" command in AMC13Tool2 and the HyperDAQ display in xDAQ. The master address table is kept as two CSV files, one for the T1 board and one for the T2 board. Most registers of interest are on T1. The CSV files are here in SVN . The T1 top-level table is named AMC13XG_Kxxxx.csv with the firmware versions in the name. It "includes" using the XML "module" syntax the sub-file AMCCounters.xml. Permission Required "r", "w" or "rw"
Description Required Text description. Must be quoted with "..."
All columns beginning with "P_" are concatenated into the XML attribute "parameters" which is processed as a semicolon-delimited keyword=value list by uHAL. No special characters are permitted in these columns (only letters, numbers and "_"). For an item to appear in the status displays, the P_Status, P_Table, P_Row and P_Column must be specified. P_Table, P_Row and P_Column are sorted alphabetically. Leading digits and "_" characters should be stripped before display so that e.g. "0_" can be used to force a sort order. The P_Status item sets the display priority. 0 is used to mark configuration registers which may be optionally displayed or not according to user preference. Positive integers 1-9 indicate various levels of detail for status values, with value 1 indicating the highest priority items which should always be displayed. In the P_Row and P_Column fields, the sequence _n where n is a digit 1-9 results in substituting the corresponding field from the delimited id, e.g. if a field is _2 and the id is STATUS.AMC01.ERRORS then the resulting value would be AMC01. If P_Repeat is present, it must be an integer count of the number of times this entry is to be repeated in the status display. An offset of 1 is assumed for subsequent entries unless a different address offset is specified with P_Offset. If P_Repeat is specified, either the P_Row or P_Column may have a trailing _d which will be replaced with the decimal value of the repeat counter. There are many 64-bit counters, which have otherwise identical ids ending in _LO and _HI. These should be treated as a single 64-bit value for purposes of display, if their Table, Row and Column parameters are identical. The csv file is converted to XML by a perl script in the above directory named csv_to_xml.pl. In the "Text Import" dialog box be certain to check "Comma" in Separated by and "Quoted field as text". 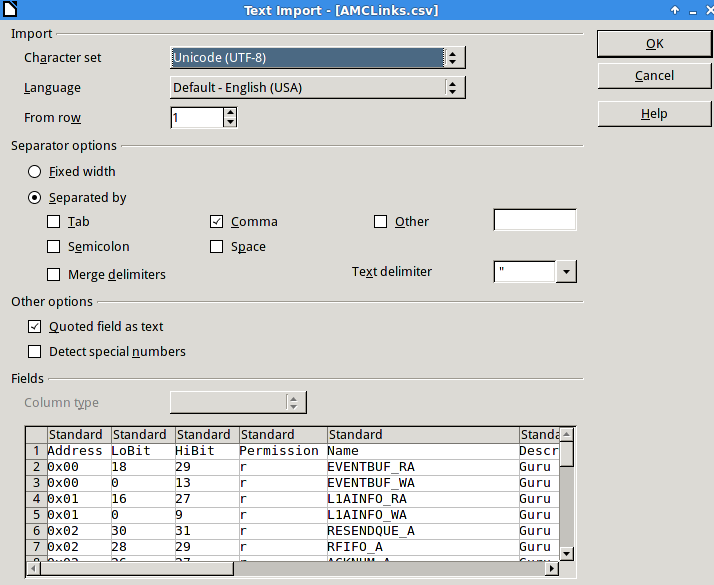 Edit the file, observing carefully the parameter use as documented at the top of this page. 4. Save the file. Select "Save using CSV Format". 5. Generate new XML files by typing "make"
This creates the files AMC13XG_T1.xml and AMC13XG_T2.xml in ...amc13/etc/amc13/. Some extra step(s) may be needed to correctly deploy these files in a production system.